Steve: I wasn't saying that the SY was an influence on the tarot images or order or subjects. I have no idea. It's possible, but yes, unlikely. By the time anybody would have thought of correlating the tarot with the SY, that part (tarot) was already done. I was merely trying to construct a "memory theatre" that might have used the tarot deck along with the SY and writings on the sefiroth (Pico, Ricci, Reuchlin). I hadn't actually thought of using the SY at all until I discovered that with a reversed planetary order it fits the A type tarot sequence. Steve, I don't see how your correspondences have anything to do with the SY, other than dropping "earth" from the four elements. The essence of the SY's astrological assignments is that the astrological entities go in a certain order specified by the attributes of the letters. Without that, it's not the SY. All I did was reverse the order of the planets, so that it would be the usual Chaldean one, which is what I think would naturally have been done by someone constructing the "memory theatre" of that type. Otherwise the Bagato would be associated with Saturn, the Popess with Jupiter, the Empress with Mars, the Wheel with the Sun, the Tower with Venus, and Judgment (C order) or the World (A order) with Mercury. Of these a couple make sense, but not enough of them for one-step meaningful associations to be possible for them all. Then there's the zodiac to deal with. Given your assignments for planets and elements, what are the associations for the signs of the zodiac, Steve? I don't think the ones I gave were too bad. They have plenty of information in their associations, from the SY astrological entity to the imagery on the card. That's a good thing. Identifying the Sun card, for example, with the astrological planet of the Sun encodes no information. It is a no-brainer; but that makes the association less useful in a memory theatre than other things, unless it happens to fit an SY letter sequence. My object was to construct a Kabbalistically oriented mid-16th century tarot, with both astrological entities using the SY and the sefiroth from Gikatilla, Pico, Reuchlin, etc., such that memorizing the relationships would both be not too hard and be a way of remembering information. It gives you the SY astrological assignments, something about each sefiroth, an additional way of seeing the tarot as a path from and to heaven, via the sefiroth, as well as the operation of Pythagorean number theory in all three Renaissance worlds (divine, celestial, and earthly). These all seem to me handy tools for any 16th century occultist doing cartomancy (which is also part of the framework). mikeh wrote: I see no problem with Death as 14th; that was normal in the A order (and probably a reason for not putting a number on the card). But not not putting any of the Minchiate cards immediately after the Tower on the sheet is a systematic omission, not an accidental one. No early Trionfi or Tarot deck had death as No. 14 ... ??? On the Death card, I didn't say No. 14. I said 14th. Here are the A orders again. The woodblock plates were part of the production costs. If you made one plate, which was used only once in four deck productions, this might have been considered as not economical, at least not ideal. That's especially risky, if you have no guarantee, that the deck type really would sell long enough (in the phase of innovation). It is good that you qualify your argument by adding "in the phase of innovation". Since the majority of the cards have numbers on them as part of the production process, I would assume that the Rosenwald was done after there started being a demand for and acceptance of numbers on the cards, and after there were 22 standard subjects, perhaps even in a standard order, in a given place. That makes it at the very end of the 15th century at the earliest. I wouldn't think that was in "a phase of innovation". In the case of the Rosenwald-4-sheets-deck the producer might have sold the 3rd and 4th sheet for more money than the both others. Yes, but that is probably true whether it was a tarot or a minchiate. He might get more money if it was a minchiate than if it was a tarot. But since we don't know how much Rosenwald decks (or supplements to regular decks, as you hypothesize) sold for, in comparison to similar decks (or supplements) of tarot or minchiate, that information is not of much use. I would assume, that the SY (or the Kabbala) wasn't popular enough before 1486 to take an influence. So would I. These are not "influences", they are associations, and they do not start being made until after Pico's publication at the earliest, and more likely after Alexander VI said that Pico was OK. I think I even mentioned Alexander VI in the associations I gave (for Taurus). Saturn rules the first planetary hour of Tuesday [mars] night ; Mars rules Friday [venus] night; Venus-Monday night; Moon-Thursday [Jupiter] night; Jupiter rules Sunday [sun] night; Sun rules Wednesday [Mercury] night; Mercury rules Saturday [Saturn] night. ps: If you use the night hours order Saturn, Mars, Venus, Moon, Jupiter, Sun, Mercury and apply the 7:3 heptagram to it, you get the Chaldean order; apply the 7:2 heptagram you get the days of the week. Juggler & Popesse seem quite mercurial, so Gemini & Virgo, with Angel as ruler. Emperor and Pope? The lights of the World (the emperor on the ladder of the Moon and Pope on the ladder of the Sun), so Cancer and Leo, with Sun and Moon as ruler. Empress & Lovers Venusian, so Taurus and Libra, with Star as ruler. Wheel of Fortune and Hermit quite Saturnine (as pertaining to time), so Aquarius & Capricorn, with Devil as ruler. Hanged Man & Death --- the greater Malefic is taken, so the lesser, Mars, so Aries and Scorpio, with tower as ruler. mikeh wrote: The essence of the SY's astrological assignments is that the astrological entities go in a certain order specified by the attributes of the letters. Without that, it's not the SY. Well 16 is easy, Beit means house, also it is attributed in most versions of the SY to the planet Saturn, the greater malefic in astrology, often described as bringing sudden downfall to those at the top. A suitably 'dark' planet for a 'dark' card. One word that immediately springs to mind without having to look in a dictionary is 'babel'. A symbol of mans downfall, fall from grace through his own pride and ambition, for the sake of his own glory rather than that of God, and in need of salvation. 17 - Star, Gimel means plenitude, and is attribute to Jupiter, the 'greater fortune' in astrology, symbol of abundance, of hope and the good. Certainly the mood of this card is much brighter than the former. The form of the letter is said to that 'of a rich man running after a poor man to give him gifts', in relation to which in connection with the letters number, 3, and the star, we may think of the three wise men bearing gifts; for that gift of God the Father [Dieu Pater = Jupiter], the Son, a gift for the sake of man's salvation. And in relation to the meaning of the name gimel, Christ is the plenitude, the abundance, the pleroma. 18 - Moon, Daleth. The mood is again dark, suitable again in that daleth is attributed to the lesser malefic Mars, planet of bloodshed. The blood shed by Christ to wash away our sins. And the sky went dark, the moon has eclipsed the Sun, as the shadow of death has taken the Sun. In myth an eclipse is said to form a hole in the sky, a door through which we may ascend to the celestial, or the celestial descend. The crab, diogenes, says 'move aside, you are blocking the Sun', or to put it another way, 'Roll away the stone', the door [daleth] across the tomb. 19 - Sun, the Son, is victorious over death, resurrected; and those that believe in him, as little children, shall play in his garden. Kaph means hand, but also the pans of scales, symbol of God's Justice, its planetary attribution is the Sun. 20 - Judgement, the angel blows her horn, that not only awakens, but cleanses our sins through God's Grace, upon which salvation is dependent. Pe means mouth [blowing the horn] and is attributed to Venus, planet of Grace. 21 - World, Eve is redeemed, the cosmos restored, we have returned to the beginning. Resh means 'beginning' and is attributed to Mercury, the messenger, a type of Christ as Logos, the word of god, whose message is written in the gospels of the four evangelists symbolised by a man [Christ birth and humanity], an ox [Christs sacrifice], a lion [Christs resurrection] and Eagle [Christs ascension]. Mercury too, like the central figure, is often portrayed as Hermaphrodite, symbolising the return to the beginning, of the dyad to the One. 22/0 -the fool, Tau, meaning 'sign' and attributed to the moon, our 'lunatic'. From my perspective, it works fine. Jupiter was the planet I associated with the Sun card. The Sun works as either the World (the planet associated with Christ) or the Angel (Christ as judge), and Mercury as the Angel (conveyer of souls) or World (Christ as Word). It just seems rather ad hoc, unless there are times in astrology when it is necessary to visualize the septenary star. That would make the associations a good exercise in visualization. Your C order zodiac attributions work, too. Not the SY, but definitely astrology. There is some relationship to the SY, in that it has a division into the same three groups. Having the zodiac first before the planets is logical, since the sphere of the fixed stars is further out than the planets. In that way it corresponds to Etteilla's assignments a couple of centuries later; but his have no discernible connection to a memory theatre or Kabbalah. They are just easy to remember (and also on the cards). Your letter correspondences to the planets also seem to work. It's a strange way of applying the SY, but keeps to its assignments by way of using the meanings of the letters. Ingenious. My only question is, would all those associations have been known by Christians in the mid-16th century? Offhand, it seems reasonable that they would have been, but I don't know. That period was the heyday of Hebrew studies, before its opponents were able to regroup after their disaster with Reuchlin. Then it would be good to have something similar for the other letters. I wonder if it would work. Otherwise, your previous assignments, while not using the SY's, would work, replacing the Fool with the Devil. Well, the Devil is ruled by God/Jupiter, as we know from the book of Job. No problem. mikeh wrote: It just seems rather ad hoc, unless there are times in astrology when it is necessary to visualize the septenary star. Well the planetary hours were much used in practical cabbalah too: in making astrological talismans for example, or the creation of magical images (such as might be used in the art of memory). While not used much nowadays in natal astrology, they were a factor in medieval horary astrology. The three different orders (7:1;7:2;7:3), could also give us three rows of seven seats, a mini-memory theatre if you like. (There are more rows possible with a little formulaic manipulation - but these three are the most straightforward). To these 21 seats one could also add another 12, the signs of the zodiac the lights and each planet rules (their are 6 night signs and 6 days signs, so one could link them up with the planets in accordance with the day hours order and with the night hours order). It is another form of cosmograph, which could be applied to the art of memory. Chaucer is full of astrology, for a medieval view/dramatization of the planetary hours in particular, see especially his 'knights tale'. The temples of the gods are in the amphi-theatre, and prayers are made to them in accordance with the planetary hours. *As an aide memoire easier perhaps would be to have 7:1 as the days of the week, which everyone knows, and draw from that the chaldean order and night-time hours. With the seven doubles he engraved 77 things, and the Holy Palace (78). On the Death card, I didn't say No. 14. I said 14th. If one assumes, that the sheet row was arranged correctly, the interpretation of Death = No 13 would lead to this, which partly is an improvement, as the Minchiate gets some correct numbers (same numbers as in later Minchiate). As we have only 19 trumps to add, we reach only 39 trumps, though Minchiate lives generally from its ideal structure: 40 trumps and 40 number cards. Naturally there's no guarantee, that the sheet row was arranged correctly. It might have accidental errors. ... we've not much indication, that Minchiate decks satisfied the "very expensive taste". If we assume, that the mid 15th century market knew different versions of Trionfi cards with different motifs and with different number of trumps (14, 16, 20, perhaps even 22) and generally an experimental phase, it isn't against logic, that somebody took motifs from various versions and composed a version with very much trumps. We have no confirmation for a great success of Minchiate in 15th century (only 3 notes), though there's the condition, that occasionally Minchiate decks possibly were addressed as "Trionfi" in documents. Berni, who speaks of "sminchiate", notes "200 cards" in his related text, which might be just a joke and a exaggeration just for fun, but who knows, perhaps special Minchiate editions reached indeed really such a high number. Lorenzo Spirito composed in 1482 (or already 1473 ?) a lot book version, which operated with a 20x20x20x20-scheme, possibly imitating an already living Minchiate-version. The option is given, that the Rosenwald Tarocchi might have existed already around 1463. It's naturally nothing, on which we can rely upon. 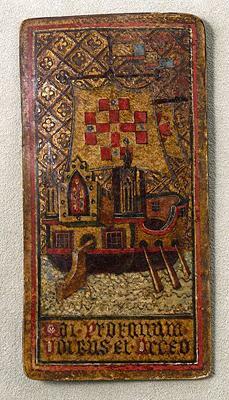 It might be also from early 16th century. If this is true, then the game of Doppio would have been a natural forerunner for a hypothetical 96-cards-Minchiate some time later. Well, it's just common marketing development. We can observe similar price-falling tendencies for electronic media nowadays. World - Jupiter (that is, God the Father, Dieu Pater). The German lot book with donkey and pope and 22 positions used rather obviously 13 zodiac signs (with a 13th month based on the moon-year) from 1-13, and then followed (likely) 5 planets as birds and then moon as 19 (stag) and sun as 20 (dog). This model goes in the direction of your model. Sun + Moon have a special role, as in the association of planets to zodiac signs, where Moon has only an association to Cancer and Sun only to Leo (all other planets are associated to 2 zodiac-signs). The Meton-cycle with 19 years used 13 months for 7 of its years, possibly another way to create a relation to 7 planets (the years 3, 6, 8, 11, 14, 17, and 19 got 13 months). It seems that Tin, the metal of Jupiter, is in the middle. Otherwise (even though nobody knew it), it fits an order well correlated with the tarot from World to Tower. I am not sure I understood your point, however, Steve, because of where Jupiter is. By density, we have Gold, Mercury, Lead, Silver, Copper, Iron, Not very enlightening. All the colours of the Great Work were supposed to reappear, in a more rapid and transitory manner, during the operation of multiplication. Sometimes the stages of the Work denoted by the appearance of characteristic colours were known as regimens: [column 2:] such were the regimen of Saturn (black), the regimen of the Moon (white), the regimen of Venus (green and purple), the regimen of Mars (rainbow), and the regimen of the Sun (red or golden). Yes, but "since c. 1463" covers quite a number of years. We cannot conclude that the Rosenwald is c. 1463. I am not against your speculations about the Rosenwald. I just don't find them any more reasonable than other people's speculations that the Rosenwald is a tarot, It still seems to me as reasonable as not to speculate that the fourth sheet had four repetitions of six cards. By atomic weight it's the 7:2 order, if you go from heaviest (lead) to lightest (Mars) you start with Saturn and go anti-clockwise to every second point; vice versa, from Mars (Iron) clockwise every second point. The earliest reference I recall to seeing this was in a book by Sepharial-- the night hours connection is the one I wasn't previously aware of. I was only speculating that through the metals there might be an association with alchemy, I haven't really looked into it. Re: Camillo starting with Saturn/Binah; Saturn and Binah are connected by several authors of early kabbalistic authors (both being connected with the fifty gates of understanding, which is related to the 49 years of Jubilee), including one of Mirandola's own teachers/translators. Mirandola's order as far as I am aware is unique to him (except in as much as those that followed him may have used it). We can also use just the 7 for 77/78 (and perhaps connect them with SY 4:15). All we need for cartomantic purposes is to have an association between the cards and planets & signs and we have a divinatory system as rich as astrology or geomancy, as per one of Etteilla's methods. Bruno's treatise on the art of memory, the Incantation of Circe, starts with planetary invocations of the Sun and Moon (at bottom of the ladder), then to Saturn (at the top of the ladder) and works down from there in order Jupiter, Mars, Venus, Mercury.